Built from current kanji755/macemu source. This build is 64-bit Intel only. Compared with my 2014 build it has the same new feature (with some bugs that can be avoided) and it solves the same bugs as the 2018-02-23 32-bit test build. - False colors after hiding SheepShaver or after minimizing SheepShaver window solved. 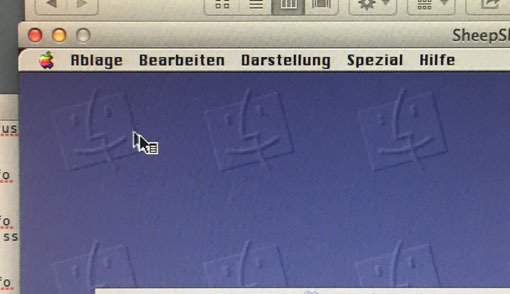 - Cosmetic issue with the mouse cursor in macOS 10.13 solved (SDL patch by kanjitalk755). - Does this build run in MacOSX 10.6? Last edited by Ronald P. Regensburg on Sat Jun 16, 2018 5:09 pm, edited 2 times in total. Runs in 10.6, I tried in a VM. I cannot boot full screen, SheepShaver crashes immediately. Full screen key combo also crashes SheepShaver. Same behavior under 10.6 here, I just tried in a Parallels VM. I still have a separate 10.6 partition to boot from. Will try that also. Same if booted from the 10.6 partition. Thanks. So, I suppose it is better to not use 64-bit SheepShaver in 10.6. Reports for running this build in any OSX version 10.7 and later welcome. BTW: How does the other (32-bit) test build behave in 10.6? Last edited by Ronald P. Regensburg on Sat Jun 09, 2018 2:21 pm, edited 2 times in total. Tried in conventional 10.6.8 setup running 64-bit kernel. In window mode, Sheepshaver opens, saves, prints. The keyboard setting between the standard US keyboard and the Dvorak keymap is reversed. In fullscreen mode, crashes on open. Last edited by jrethorst on Sat Jun 09, 2018 4:49 pm, edited 1 time in total. Reports for running this build in any OSX version 10.7 and later welcome. On 10.8 full-screen mode works. No cursor-issues. If there's something else you want me to test, let me know. Tried in conventional 10.6.8 setup running 64-bit kernel. In window mode, Sheepshaver opens, saves, prints. The keyboard setting between the standard US keyboard and the Dvorak keymap is reversed. Does it behave differently compared with previous builds? Here I can use different keyboard layouts correctly, including Dvorak, provided SheepShaver is set up with the keycodes file and the appropriate layout is selected in both host and guest. In fullscreen mode, crashes on open. On 10.8 full-screen mode works. No cursor-issues. Here's an odd one; it's happening in the previous build too. When I try to change the Unix folder from /Users/<user>/Documents to something else, OS 9 throws an error that the drive cannot be found. If I quit SheepShaver and re-start, it loads /Users/<user>/Documents, even though the prefs file still shows the correct alternate location. The location doesn't seem to matter, so it's not a permissions issue. Also, this doesn't seem to happen in older OSes; no problems with 7.1.2 through 8.6. Also no problem with the 2014 build and 9.0.4.
 weird; must not be the build; I've finally somehow fixed it. Locked the prefs file, opened my sheepvm manually, and now it's loading the correct location and re-building the file index. It looks like the "software cursor" got stuck on the screen. SheepShaver uses two different ways to display the cursor, the hardware cursor in window mode and the software cursor in full-screen mode (and in some other specific situations). I can force the issue, however not consistently, when I first use control-return to go to full-screen mode, then use control-F5 (which grabs the cursor when in window mode) and then again use control-return to go back to window mode. Does it happen with you always when you only toggle between window mode and full screen mode with control-return? Last edited by Ronald P. Regensburg on Sun Jun 10, 2018 2:09 pm, edited 1 time in total. Corrected when software cursor and hardware cursor are used. When I try to change the Unix folder from /Users/<user>/Documents to something else, OS 9 throws an error that the drive cannot be found. That error is quite common after changing settings in SheepShaver. After saving changes to prefs one should always quit SheepShaver and launch it again. "Manually" as opposed to what? Do you use the Launcher? Could the issue be related to using the Launcher? I've never actually used full screen mode until yesterday. I don't need it for what I use SheepShaver for. But I've tried again a few times and it always happens. I've also tried with the old build. It doesn't happen there under 10.8. Yes; it's not the quit and relaunch issue. It's when I use the launcher. Dragging the sheepvm file over the executable worked correctly. And then after locking the prefs and double-clicking the sheepvm file, it something changed and re-indexing started, after which it behaves correctly even using the launcher. I've tried again a few times and it always happens. Edit 1: I can reproduce the issue here in High Sierra in both 64-bit mode and 32-bit mode when I toggle between window mode and full-screen mode quickly and repeatedly. When the double cursor appears, pressing the control key solves it. Holding the control key a little longer when doing control-return seems to prevent it. Does pressing the control key remove the extra cursor for you also? Last edited by Ronald P. Regensburg on Mon Jun 11, 2018 11:06 am, edited 3 times in total. If I do that there's no cursor at all in full screen mode. It responds normally when I click somewhere, though. It did when I just tried again with the initial build in this thread. But only with the left ctrl-key. I actually tried that when I first tested the initial build a few days ago. Back then it didn't disappear. Now, after it did, there was no cursor anymore when switching to full screen mode again. Seems to be inconsistend behaviour. At least I don't know why it is. Loosing the cursor after changing mode is an old issue that has been only partly solved. Also a persistent white screen can happen after toggling between window and full-screen modes. These issues can not be consistently reproduced. One can usually prevent both issues by first clicking somewhere on the SheepShaver desktop before using control-return. The worst problem with the recent builds seem to be SheepShaver crashing when trying to run it in full-screen mode in MacOSX 10.6, in both 32-bit and 64-bit mode. Maybe it is best to only focus on a 64-bit build for 10.8 and later. The white screen issue sounds like improper image buffer handling; it's possible that changes in screen display methods have caused the fast method SS uses to write to screen to only be partially compatible with the new method, and recompilation has made it incompatible with the old method. IIRC, 10.7,10.10 and 10.13 all made some changes in this area. Is SS using SDL (1.2 or 2) to manage all this? If so, the problem is likely with SDL more than with SS. SheepShaver uses SDL 1.2 and, yes, most display issues are SDL related. Insofar I understand what has been done to address these issues, some issues (color shift after minimizing/hiding) are solved and some (white screen and cursor loss) are mitigated by forcing SheepShaver to redraw. OK; that really sounds like the white screen and cursor loss are the old SDL 1.2 buffer issue coming back. Forced redraws will make the situation better by preventing emulation from waiting for the buffer to fill before releasing it, but at the cost of performance. I'd think that https://github.com/DavidLudwig/macemu would help even more to both fix those issues and modernize the display stack. The last SS-related commit was over 9 months ago though; anyone know if there's ongoing work with the port? It is a pity that there are several forks where people do their own thing without communicating back to cebix/macemu. This results in diverging forks, each with different possibilities that do not come together. I built my 64-bit builds from https://github.com/kanjitalk755/macemu. By doing this, 64-bit SheepShaver becomes SDL2 based. Also I changed to use software cursor because hardware cursor has issues in full screen mode even if SDL2 is used. If you want to use hardware cursor in windowed mode, add following line to pref file. Does this build fix the white screen after full-screen switch bug? Wasn't it so that the hardware cursor was only used in window mode where the software cursor was used if a custom cursor image was required and that in full-screen mode only the software cursor was used? I noticed that there are no SDL frameworks inside the package, but as I have both SDL.framework and SDL2.framework installed in /Library/Frameworks/ that should not be a problem. I nevertheless tried adding a directory "Frameworks" with both SDL frameworks to the package. Does not make a difference. Maybe the Xcode project needs updating?